C.M. Miller authored at least eleven North Carolina county maps (nine separate counties) during the early 20th Century. Who was this forgotten cartographer, and which counties did he map? 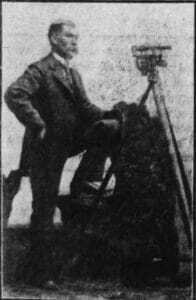 C. M. Miller, from the Winston-Salem Journal, May 17, 1908. Miller’s occupation is listed as “Surveyor Land” in the 1900 census. In June 1901, at the direction of the Salisbury board of aldermen, Miller began work on a map of Salisbury.4 This is the earliest known published map by C. M. Miller. Map of Salisbury N.C. (1902/1903). Drawn by C. M. Miller. The map measures approximately 4 x 7 feet. 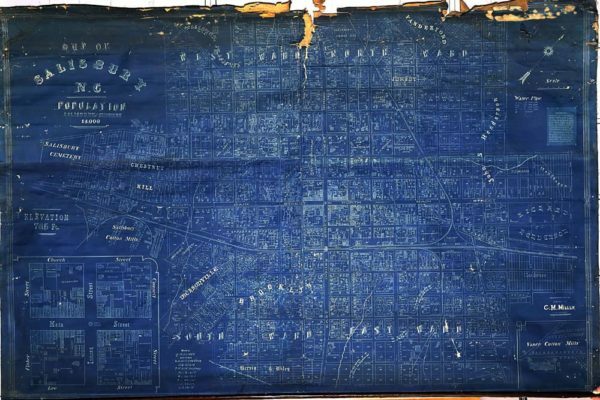 Calvin M. Miller, “Butner Map of Salisbury,” Edith Clark History Room, accessed October 27, 2018, https://edithclark.omeka.net/items/show/10. (The Butner appellation does not refer to anyone associated with the creation or publication of the map, but to the family who donated this copy of the map to the Rowan Public Library.) A low resolution image of the entire map is available here, and a series of about a dozen photos of sections of the map are available on these web pages: page one and page two. County Surveyor C.M. Miller of Rowan has sold a large number of maps of the county which he completed about a week ago and the first shipment of which he has just received from the Rand, McNally Company of Chicago. The map, which is one of a very few county maps in North Carolina, is complete and unique in every respect, showing as it does each township, village, public road, all rivers and creeks, and shows the name and location of each land owner in the county. The granite and copper belts are also shown, as well as all churches, school houses and mills in the county. It is pronounced one of the most complete pieces of work of the kind ever exhibited in this section. It required about one and one-half years’ work to get it out. “Raleigh, N.C., April 27, 1904. I am in receipt of a beautiful map of Rowan county, presented to the State Library by Mr. C.M. Miller, Civil Engineer and Draughtsman, Salisbury, N.C. It is needless for me to say that Mr. Miller has done his work well. Persons needing work in his line will do well to write to him. I will thank the newspapers of the State to call attention to the fact that only eight (8) counties of North Carolina have county maps in the State Library, to-wit: Bladen, Catawba, Moore, New Hanover, Randolph, Robeson, Wake and now Rowan. It would be well for each county to send in a map. Often persons call in the State Library to see a map of certain counties and I am unable to accommodate them. Churches, school houses, copper, gold, granite, etc., are located in the Rowan map, a good advertisement of Rowan County. Mr. Miller has certainly done his county – Rowan – and the State in a sense, a real service in placing this map in the State Library, and we are surprised to learn, as we do from Mr. Sherrill, that such a map of each of the counties of the State is not there. The cost of preparing a map of a county cannot be enough to approach being a burden, and each county should have the work done, and by all means have a good one, showing locations of churches, schools, and industrial plants and mineral or other deposits as far as may be, in the State Library. Several of the above county maps can be seen on the NC Maps web site. Map of Forsyth County N. C., drawn by C. M. Miller, C. E., Winston-Salem, NC, December 1927. 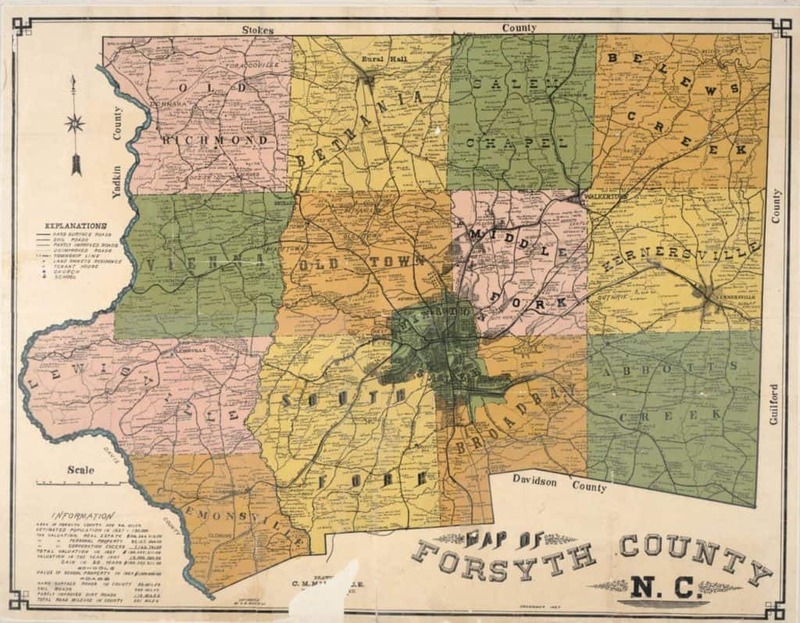 This example is in the Forsyth County Library and the image is courtesy of the North Carolina Maps digitization project. Click on the image above to see high resolution image on the NC Maps web site. Due to the scarcity of Miller’s 1904 map of Rowan County (many copies had burned in a house fire a few months after delivery), Miller published a revised map of Rowan County in 1913. A change in Forsyth County’s western boundary (adding territory to the county) was one factor prompting a 1927 revised edition of Miller’s Forsyth County map. Calvin Miller provided private and industrial property surveys and topographic surveys for roads. His work as a civil engineer included the construction of roads and bridges. Miller’s work covered a broad geographic territory, from Union County bordering South Carolina, to Surry, Stokes, and Rockingham counties bordering Virginia; from the Blue Ridge to the easternmost point of Wake County. After unsuccessfully lobbying for a position in Forsyth County, Miller was appointed Wake County Highway Engineer in 1915. Miller and his family lived in Raleigh for the next 7 years. Want to read more? A bazillion newspaper clippings mentioning Calvin Miller and/or his maps have been transcribed and are available, in chronological order, via this pdf. Want to search for more? The Rand McNally archives, at the Newberry Library in Chicago, could contain records pertaining to Calvin Miller’s business dealings with that company. Rand McNally’s name is not found on Miller’s county maps, but they were the publisher according to one newspaper article. County commissioners’ minutes for Rowan, Wake, Forsyth, and any county for which he published a map may contain additional information. Comments, questions, and especially corrections are greatly appreciated. Please use the “What’s on your mind?” comment box below. As early as 1909, Laney et al give the date of the Rowan County map as 1903 (Laney, Francis Baker, and Katharine Hill Wood. 1909. Bibliography of North Carolina geology, mineralogy and geography: with a list of maps. Raleigh: E.M. Uzzell & Co., State Printers and Binders; Entry #654, p348). Perhaps the map was published with a date imprint of 1903. However, the earliest mention in newspapers of the published Rowan County map is 6 April 1904 issue of the Charlotte Observer, stating that the first copies of the map arrived in Salisbury on 4 April 1904. Greensboro Daily News, Friday, June 28, 1907, p3. This entry was posted in 20th Century and beyond, Map Advertisements, Town Plans and tagged C. M. Miller, Calvin Milas Miller, Calvin Miller, county maps by crmaps. Bookmark the permalink. ssumed that he derived from one of the Moravian Millers who live in great abundance in the Forsyth County area. To my mind, the precision of Miller’s maps bespoke the same kind of precision that went into Wachovia maps from 1750s to the late nineteenth century. But from this rendition, it is clear that Rowan’s C. M. Miller picked up and made good use of the century and a half of great cartography that already existed in Moravian Salem. I’ve used Miller’s county maps extensively and they are really the best early county maps we have for all of those counties. It would be great if C M Miller (map maker) was somehow connected to Lieut. Francis Miller, surveyor, cartographer and Halifax recruiter for His Majesty’s Black Carolina Corps in 1791. Thank you for visiting the NC Map Blog. I don’t know C. M. Miller’s family tree, but he was born into a Lutheran family in Rowan County which very likely makes him a descendant of a German Müller. I also don’t know Francis Miller’s pedigree. Was he from a British (Scottish?) Miller family?